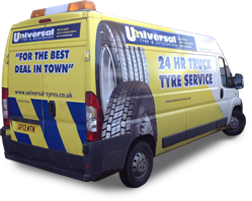 We offer a comprehensive tyre fitting service here at Universal Tyres, specialising in the supply, fit and service of a huge range for both private motorists and large, commercial fleets. We supply tyres for all vehicles, from cars to motorcycles to agricultural machinery – either in branch or direct to you with our mobile tyre service. With our head office in Dartford, we have various branches throughout the London, Essex and the South East. So give us a call at Universal Tyres today, or pop into your local centre. To find your nearest branch use our handy branch finder. Why Choose Universal Tyre & Autocentres?